This thread is mainly to discuss a few points. The current state of guilds, where they're currently headed, why they're headed in that direction, and what to do to steer them in the right direction if need be. It's stale, and mostly forgotten. 2. Where is it currently headed? It is like a ship with no sails in the middle of the ocean on a windless day. It is not headed anywhere unless we change that. 3. Why is it the way it is? There are several reasons behind the current state of the Blacksmith Guild. Reason number 1 is awareness. Reason number 2 is need. Finally Reason number 3 is what it offers. 1. Those people who are aware of the Blacksmith Guild, current members included, do not go out of the way to make the guild known to newer players. Actual members of the guild are not fully aware of what all they can do as a smith. New players aren't much aware of the guild, and don't have much exposure to the guild. 2. When all a smith can do for new players is bump up their equipment 1-3 for min/max they’re not going to go out of their way to offer to do that, whether for free or not. New players have no pressing need to ask for a Blacksmith’s help, and from reason 1 they aren’t aware of the Blacksmiths’ services in the first place. Mid-high level players don’t need blacksmith gear for the gear that’s already out there outperforms it, has unique abilities, and the stat requirements are far less harsh. There’s only a slight hole in-between levels where one might ask “What equipment is better than this that I can equip before I go onto X piece?” While not aware of the services a Smith can offer they will not think to ask, and unless Smiths speak up that they can do something (refer to reason 1) awareness will remain where it’s at, and need for Smiths will stay where it’s at. 3. What do Smiths offer? Bumping min/max 1-3 points and/or lowering required level down by 1-3 levels, forging new equipment, and slotting gems into equipment with gem slots. The first ones only really affect new players heavily as monsters only have so much defense that those 1-3 points per equipment piece really add up. You can always work your way up 3 levels to equip a new piece, so that part only really affects people impatient for something new to wear (not that impatience in this case is a bad thing). Forging new equipment…requires coal, ore, energy, proper level, and the knowledge of how to make each piece. These pieces of equipment don’t go very low in level requirement, tend to have high stat requirements for newer players who have reached that level, and don’t offer much that they can’t get from other pieces of equipment. Slotting gems requires gems, proper level, and knowledge of how to do so. This is only useful for boosting blacksmith gear. While slotted gear is better than not-slotted gear, a boost in stats doesn’t replace a Royal Amulet of Blood, the ability to deal DD to your opponents, and all the other useful abilities that are out on some of these pieces of gear. The guild needs to offer something that anything else cannot provide. This must be something that brings all 3 of my points into harmony. As a guild we need to offer something that you can’t get from anything else out there, this should bring awareness to new players, old players, and guild members alike. This has to be something that means we see more frequent activity in the guild and of players speaking of or asking for the guild’s services. The guild needs change for the better and for that we need to see a change in awareness, need of the guild, and what the guild can offer. That ends my perspective on the Blacksmiths Guild. Here are some new mechanics and skills which will make being a blacksmith a much more rewarding experience, both for the smith and for all potential customers. By default, all items when received new would be set to "pristine" condition. This means they suffer no wear and tear, and are suited for battle. However, everything wears down. I suggest that for every 50 hits for light armour, 100 hits for heavy armour and 45 hits for shields, the item should lose quality (in descending order: pristine, good, fair, worn, battered). When a player takes a hit that deals damage, one of his equipped pieces of gear at random will take the hit; I also suggest that if players want to see this, they can, but that by default it should be disabled. When an item drops in quality, its stats will drop by 1-1 (newbie gear, such as wooden stick and bronze mail, will simply not break down for simplicity's sake). When it reaches battered condition, it is possible for the item to break; if it breaks, it is unequipped and can no longer be equipped until it is fixed. Enter the blacksmiths. Blacksmiths, using energy and ore, should be able to reforge items to pristine condition. This should be possible right from level 1, as I also believe that blacksmiths should stop being able to upgrade potions and the like. Using a nominal amount of coal and ore (the smith chooses the ore), he can essentially rebuild the item. As to which ore type to use, my thinking is that for higher ores, fewer units are necessary. If something would take 250 copper to reforge, it might take only 20 riwo, for instance. This will add a modicum of upkeep to one's gear, but it also involves blacksmiths more actively in the community. 1. Customs, crimsons or any other gear bought directly through the phan-store should not degrade. 2. The energy for the task of tempering an item should be twice the number of upgrades required (thus, from battered to pristine would take 8 energy, and all others would be subsequently less). 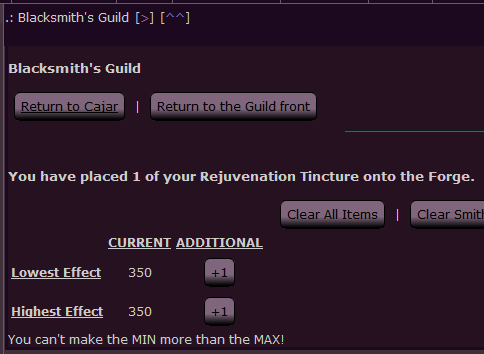 This is because a smith might be asked to reforge multiple pieces at once from the same player. 3. Event log messages should be present to notify players, in case they missed it or disabled it in account preferences, that their gear has degraded in quality. This can be applied to either armour or shields/bracers. At a cost of 10 energy and 150 of the chosen ore, a piece of gear can be given spikes. These spikes will do damage when that piece of gear is struck. The spike damage should be fairly small and incidental, but better ore yields better spikes. Example: copper spikes might deal 3-6 damage; iron spikes might deal 4-8 damage; kraexian spikes might deal 12-24 damage. Note: Spikes will remove 1 slot from the armour (see below). If a piece of armour could normally have 3 slots and spikes are added, a blacksmith will only be able to create 2 slots for it. This is used only on weapons. Whether it is the sharpening of a blade, the rebalancing of weight or the narrowing of a crossguard, refining essentially improves a chosen weapon's attributes. For 15 energy (reduced by 0.2 energy for every blacksmith level, down to a minimum of 3 energy) a smith can choose an ore to work with and can make a weapon's min or max rise, perhaps at the same time. This should replace the current mechanic of upgrading in place. Different ores would do different things. For instance, an item refined with copper might only get a 1-1 bonus. An item refined with kraexian might get a 5-12 bonus. An item refined with genali might get a 0-14 bonus. The choice is yours. An item can only be refined once. This is exactly like refining, but for armour. Note on amulets: Blacksmiths should be able to slot gems into amulets, but beyond that should be unable to improve them; these items are not, by and large, items of defense or attack. Higher level smiths should be able to take virtually any piece of gear and add gem slots to it. Blacksmith gear already comes with slots, but other gear has to be tweaked in order to accomodate gems. The piece of gear in question would have a preset number of slots available. A smith can use energy to essentially rework the weapon, adding a new slot each time until the maximum is reached. A blacksmith might see, when attempting to create new slots: "Using your innate knowledge of the piece on your worktable, you believe that this item could accomodate four gems". Note: Crimsons should not have any slots, and all one-of-a-kind quest gear should have a higher number of slots (owing to its rarity). All swift swords, for instance, should have the same number of slots; what a player does with them is their business. Game rolls a number between 0 and 100. In this way, it is possible to have a 99% chance of success, but not at all likely. This option will be more useful for higher-level smiths with decent wisdom, but can be useful for anyone if they're lucky or persistent enough. Wow, +1 for great ideas Kara. I guess I thought it need not be mentioned, but I'll put it out there so others know as well. Blacksmithing takes forever to level, and that is because at most you can get about 9 exp per energy, but reality puts the average to between 5-6exp per energy (keep in mind this is if you are solely boosting min/max on items, not reducing level requirement, not slotting gems, and not forging new armor). Leveling for anything in this game has the same level formula, which means you need the same amount of experience to get your character to level 50 as you do to get your Blacksmith level that high as well. While there might be zones, and even the Ascetics Charm to help get your character to higher levels quicker, there is absolutely nothing to get your Blacksmith skill higher. I don't think we need the character leveling to be similar to Blacksmith leveling, but I do think there need to be changes for the easing of leveling your guild skills. Simply my biased opinion. I do believe that you should level guilds a good deal more slowly than you should push your main level. Guilds are never going to be one's primary method of advancement, not in a game like this. That said, I do think getting more than 7-10exp per smithing would be to the good. This way, you'd still drag through the levels, up to a point, but you could at least get a little more speed. honestly loving the revamp ideas and I know there's a lot of different aspects that we are all voting for to get revamped. The detail is great and Hunar and Kara have my vote here. Kara - thanks for the attention to detail that you provide in your posts. Hunar - Thanks for bringing up yet another aspect of the game that I would love to see changed!! I think it would be a good idea to make the Blacksmith, Fisher and Miner chats public so that players can go in there and make requests. I believe the only guild with a chatroom is the Blacksmith's guild, but I see your point. It might take a short while for somebody to reply if people were aware that the chatroom was made public, because as it is hardly anyone talks in there. So as a recap; The average exp gained per 1 energy on smithing an item's min/max value up is between 5-6 so I was a little generous and decided to go with 5.6. Average energy per day a player could easily get was 403. It takes almost 1.4m exp to get from level 20 to level 141. Putting these numbers together we come up with ~20 months of straight smithing to go up from level 20 to 141 in smithing. I hope I don't have to go into how much times you've got to click to get there. The power of a smith! You have placed 1 of your Rejuvation Tinctures onto the forge. Mandy's Strongest Healing Potion. Heals 350 HP. You drink down the Tincture and gain 351 HP. 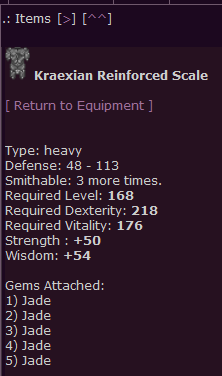 Kraexian Reinforced Scale 48-113 with 5 Jades. Plus 50 Strength and Plus 54 Wisdom. Yes, for 1 energy I get to have 1 extra health restored! Worth. Current time: 04-18-2019, 02:07 PM Powered By MyBB, © 2002-2019 MyBB Group. Theme created by Justin S.